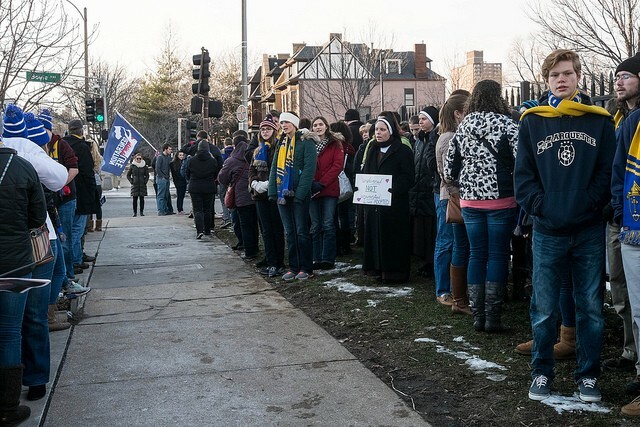 Protesters demonstrate outside the abortion clinic in St. Louis' Central West End. The bill that would create a buffer zone around the only abortion clinic in St. Louis could get a vote by the Board of Aldermen as early as this Friday. In January 2017, Alderwoman Christine Ingrassia first introduced legislation to create a buffer zone. But though the legislation stalled last year without a vote, she reintroduced it this year. Last Wednesday, the Public Safety Committee passed Ingrassia's Board Bill 34 with a 5-2 vote. Modeled after a Colorado law upheld by the U.S. Supreme Court, Bill Board 34 would create an eight-foot buffer zone around the driveways of clinics and other health care facilities. Patients and staff accessing the clinic could be in those zones, but protesters (and counter-protesters) could not. However, the bill does not prevent demonstrators from accessing public sidewalks or public streets. Ingrassia proposed the ordinance after an increase of calls to law enforcement at Planned Parenthood. Since its introduction, however, some critics have claimed it infringes upon First Amendment rights. Alison Dreith, the executive director of NARAL Pro-Choice Missouri, who has been working with Ingrassia, says the arguments simply are not true. "This is about patient and staff safety," she says. "It's about accessing constitutionally protected health care." Dreith says protesters will still be able to hand out material and pray outside of the clinic. The bill is more about pushing interactions away from the driveway to reduce accidents, she says, than limiting their ability to demonstrate. In a press release, Andrea Miller, president of the National Institute for Reproductive Health Care, gave the bill her support, saying, "The NIRH is proud to partner with NARAL Pro-choice Missouri to support this ordinance and build upon the progress already made in St. Louis to create a reproductive safe-haven in an extremely anti-choice state." A similar ordinance with a fifteen-foot buffer zone was upheld in Pittsburgh last November, while Chicago has had an eight-foot buffer zone in place around its clinics since 2009. A Massachusetts bill that called for a buffer zone of 35 feet, however, was struck down by the courts in 2014. According to a survey by the National Abortion Federation cited by NARAL, "over 50 percent of clinics reported a decline in criminal activity near the clinic after the introduction of a buffer zone." After being passed by the Public Safety Committee, the bill was introduced as part of the second reading this past Friday. Dreith expressed excitement at the Public Safety Committee's recognition of the bill and believes it will win approval.